To the novices, we recommend the Lowrance Hook 3x fish finder from the trusted Lowrance brand. So, with Lowrance Hook 3x Sonar reviews, we rounded up the budget units and this one stood out, so here are our complete thoughts on this product. 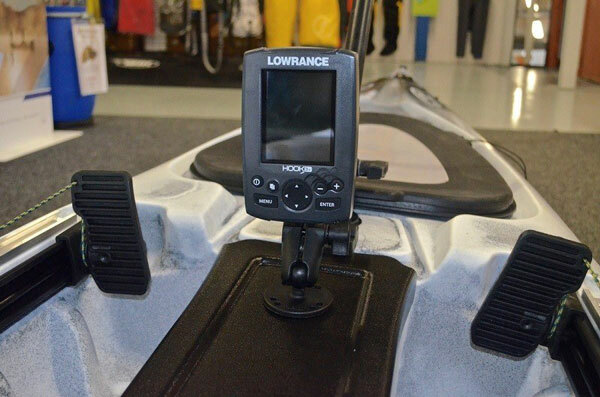 The Lowrance Hook 3x is a standalone and portable fish finder. This compact unit has small set of relevant features that simply help you spot fishes under water. It uses traditional SONAR with dual-frequency beams for a view of the objects under water including fish. This unit hits the size sweet spot of affordable fish finders and is also travel-friendly. The limited features make for very simple operation. This Lowrance fish finder is an entry-level device with basic functions meant for the new anglers. The lack of advanced features puts the new users at ease with this class of devices. The Lowrance Hook 3x fish finder is a handy and dependable unit. We delved deep into the whole spec to bring you an honest opinion on the whole unit. This will help you understand whether it’s the perfect fit for you. The Hook 3x fish finder has a compact body. It has a screen on the top half and the controls below it. This is a waterproof unit. We have heard no complaints about durability from the long-time users. But that’s expected from Lowrance units. This Lowrance fish finder has a 3” screen. This is a 256-color TFT screen with a 320x240 display which is sufficient for this size. The screen is smaller than the usual 3.5” displays like that of the Garmin Striker 4. You must take these dimensions into account for your purchase decision. It has a backlight which can be turned on and off using the power button. The screen is instantly readable from all the angles and also in bright sunlight. It offers 11 levels of brightness settings for every situation. All the functions of the Lowrance Hook 3x fish finder can be accessed with these buttons. The center has multi-directional keypad. It is flanked by zoom buttons on one side and Pages + Power buttons on the other side. The Hook 3x fish finder comes with a Quick Release Bracket from which the unit can be readily extricated. You can completely swivel or tilt the unit on this mount. You can also change the viewing angles and the screen stays visible from all angles. The Lowrance Hook 3x fish finder comes with a patented Skimmer® which can scan through traditional 2D SONAR. It has built-in temperature sensor which can gauge temperature up to 75 mph. 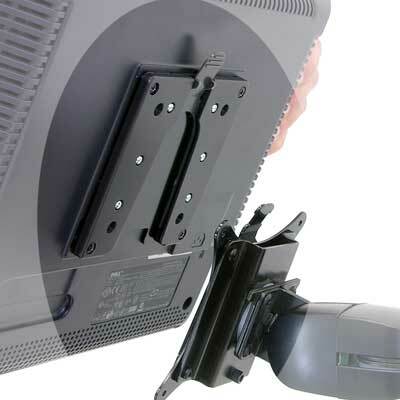 There’s a transom mount in the package that can be attached to the transom. You get about 20 feet to wire to hook it up. This Lowrance fish finder offers dual-frequency traditional SONAR scanning for finding fishes. This transducer is capable of producing 83 kHz and 200 kHz cones simultaneously. The 83 kHz beam provides a wide coverage of 60 degrees and the 200 kHz beam has a coverage of 20 degrees. The unit puts only 180W of power into the water column. The Page button allows you to switch quickly between 83 kHz or 200 kHz frequency views. The combination of dual frequency gives you more vertical structure view in the 20 degree cone. But the unit still scans more area and penetrates deeper because of the 83 kHz beam. This fish finder is best used in fresh water. For small-time fishing, we fiddled with the sensitivity and spotted enough fish arches near our boats. 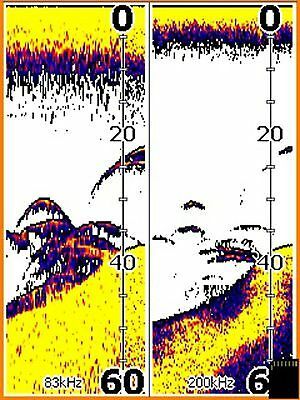 This is not as clear or accurate as the CHIRP or DownScan/SideScan, but those technologies are costly, as we know from the Lowrance Elite 7 TI or Elite 5 HDI. The Advanced Signal Processing ability of the Hook 3x fish finder automatically tunes the settings so that you can use the unit right out of the box. When you start out, this is pretty handy. But once you get better at handling the device, you should change the settings manually. You must experiment with the settings to find the best view for yourself. For e.g. : There’s a certain balance for the sensitivity setting where you can spot more fish arcs but not as much clutter as the highest sensitivity setting. 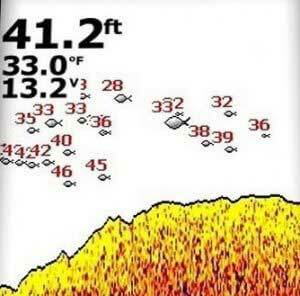 This feature of the Lowrance Hook 3x fish finder is pretty exciting for the new fishermen. DownScan and SideScan help you identify the objects underwater. But with traditional SONAR usually just show arcs. The Fish ID is more exact and shows small fish icons in the places where it detects them. 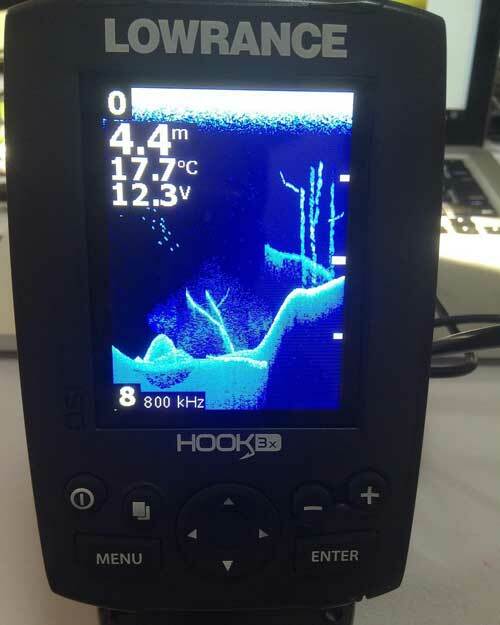 The Hook 3x fish finder has the Zoom function. It allows you to Zoom into 4x times the original view. On a 3” screen, we found this very helpful. But beware, zooming in and out every time is a hassle. If you require a bigger screen, go for a different fish finder. 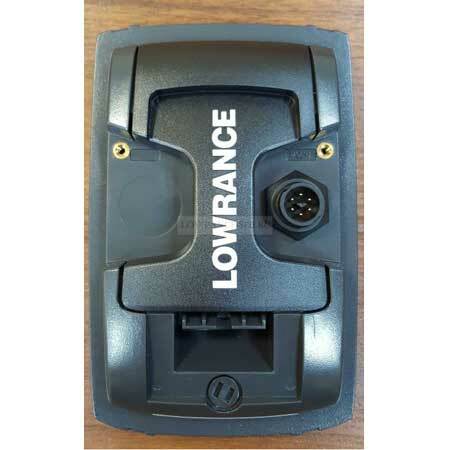 This Lowrance fish finder comes equipped with a depth alarm. Once you set your maximum depth for the day, the depth alarm will warn you if the water is too shallow based on that. 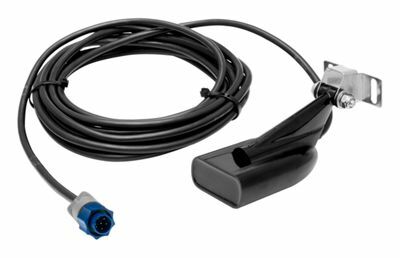 This ensures that the transducer doesn’t hit any structure or the soft bottom of the water body. It’s important to note that the Lowrance Hook 3x fish finder does not have GPS or chart plotter capabilities. GPS is somewhat essential in the current scenario. If you pay extra money, you can get a unit that is GPS-enabled. We also have the Hook 3x DSI fish finder which has DownScan Imaging for clearer images and the ability to really differentiate the objects under water. The maximum scanning range of hook 3x is more than 300 feet. It can show accurate reading from 3 feet onwards. 1. We suggest using the Hook 3x fish finder on a vessel within 40mph. If it goes any faster, the readings might become inaccurate. 2. To read the SONAR, the image moves from right to left. The image on the right-most side of the screen is what’s under your vessel at that moment. 3. Try fiddling with the settings manually to get a detailed view of the objects beneath your vessel. 4. Use the Zoom buttons to enlarge specific areas of the SONAR Image for better visibility. For someone who wants a basic unit with the easiest fish-finding ability, the Lowrance Hook 3x fish finder is the answer. This is a very reliable unit with dual-frequency broadband sounder. The convenience of settings to manage the view and the ASP is not lost on us. I need just the transducer for hook 3 with bracket only ?